Bertha Bull was born in Tipton, Iowa, in May 1869. Her parents were Joseph W. Bull and Harriet Ann (Boynton) Bull. Joseph was an attorney and a Civil War veteran, having served as a 1st Lieutenant in the 46th Iowa Infantry. The Bulls also had sons Carlton B. and Emerson K. and a daughter Clara. The Bull family moved to Duluth about 1890. They lived at 1228 East First Street, and Joseph had law offices first in the Fargusson Building at 402-408 West Superior Street, and then, by 1893, in the Palladio Building, on the northwest corner of Superior Street and Fourth Avenue West. About 1895, Bertha moved to Chicago to study at the Art Institute of Chicago. According to the book Embracing the East, by Mari Yoshihara, Bertha studied there for one year. She is listed in the 1900 Duluth city directory living with her parents and brothers at 129 Fifth Avenue West, and is listed in the 1900 census as an artist. Bertha’s sister Clara, a teacher at Irving school, tragically died on December 13, 1898, at the age of 21, from the effects of typhoid fever and pneumonia. The 1901 directory lists Joseph and Harriet having moved to Chicago. Presumably Bertha moved with them as she is believed to have studied at the Art Institute of Chicago from 1901 to 1902. In the same directory, Carlton is listed as moving to Culbertson, Montana, with Emerson remaining in Duluth. A year later, though, Emerson has moved to Mandan, North Dakota. In 1903, Bertha married Minneapolis corporate attorney Burt F. Lum. Although he lived in Minneapolis, Burt had connections to Duluth. His brother, Clarence E. Lum, was a physician in Duluth, and his brother, Leon E. Lum, practiced law in Duluth. Burt and Bertha traveled to Japan for their honeymoon, and it was then that she became interested in Japanese wood block printing. She returned to Japan in 1907 to study the technique with Japanese craftsmen. 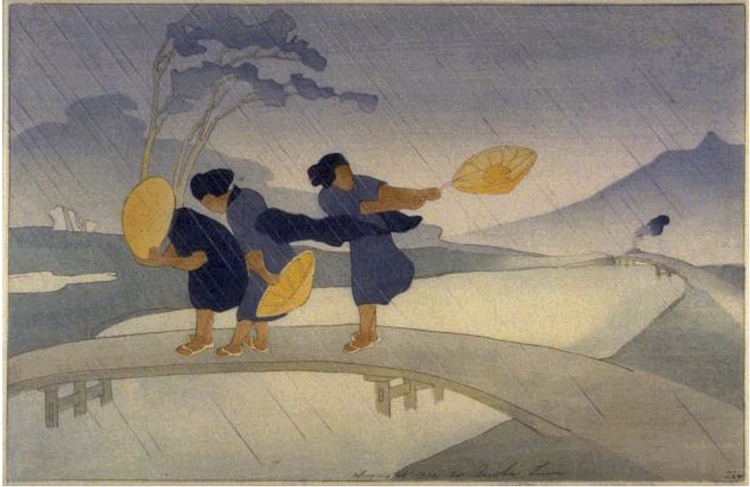 Bertha mastered the art of Japanese color wood block printing, specializing in Oriental subjects, and she became widely known for her work. A large collection of her prints is in the Library of Congress. The Lums had two daughters, Catherine Balliet, born September 10, 1908, and Eleanor Peter, born April 27, 1911. They moved from Minneapolis to San Francisco around 1916 and divorced in the 1920s. Bertha traveled to the Far East several more times and spent some years living in Peking. She died in Genoa, Italy, in February of 1954. Story by David Ouse. Originally published on Zenith City Online (2012–2017). Click here for more stories by David Ouse.